Making a difference...one SMILE at a time! 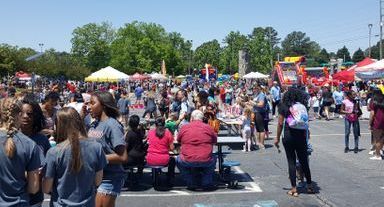 The Carnival Fun Day is from 10 - 2. Make plans NOW to join us now. We are currently seeking, participants, sponsors, retail vendors and food vendors. Click below for details. We are very excited to announce that this year we will once again host our annual Riley RUN & Carnival FUN Day! This event will take place on Saturday, April 27th at Brookwood High School. The Riley Run will start at 8am in front of Brookwood High School. We will host a 5k, Mile Fun Run and a Tot Trot. Immediately following the race at 10am the carnival will open so that attendees can continue to enjoy the day. Carnival will run from 10-2 and will include: Vendor Booths, Food Trucks/Booths, Inflatables, Carnival Games, Music and so much more. 5K Run/Walk - $30.00 per person or $35.00 and includes one wristband to enjoy carnival games and inflatables. 1Mile Fun Run - $20.00 per person or $25.00 and includes one wristband to enjoy carnival games and inflatables. Tot Trot (5 and under) - $10.00 per person or $15.00 and includes one wristband to enjoy carnival games and inflatables. All Riley Run Participants will receive a t-shirt as long as registered by April 15th. THERE WILL BE NO GUARANTEE OF T-SHIRT RECEIPT IF REGISTER AFTER APRIL 15TH. We are currently seeking sponsors for this event. Below are details for each level.